I live in South Macon about 15 miles from the end of the North- South runway at Robins. Some day are more active than other most day's at lest one are two I come out of the shop to look at them a site to behold. I went to that site it didn't look that great to me. Our's is 100 times better. We used the ramp are crew door depending on how many was being loaded, and how quick you had to load. When one of our planes was on a overnight mission the crew chief was with it and we didn't get to go to the club as soon as the plane hit the ground.This might be out of line if so let me know. Way to go Dutch we were grease monkeys to these guys but we kept these birds in the air!!!! Right back at you Happy Thanksgivings to all my fellow Airman!! In 1965 we got 1505's never wore them much once for base commander's call pass and review hot as hades that Sat. Happy Veterans Day to all that served this Country past and present. Welcome home son And thanks for your hard work. And the young man leaving god speed and be safe. Congrats Mark and good luck in your future. He has that look to me. Ah S--t what have I got into. In 1965 Oct. Name over right pocket. Branch of service on the left. who knows.Maybe he was special. Just returned today from San Antonio we had a great time the group was Air Force Together WE Severed we went to the graduation of the basic training class and toured the ASP Museum and the Airman's Museum seen the old barracks from back in the old days. It was a great week-end. Mt. Crew Chief, Here's a picture from CRB. How many crew chief's you know that didn't get a chewing now and then from a AC that had a bad nite or FE who wanted to give you a bad time knowing all the time the plane was ready to go. Dan we grew up in a time when everybody smoked there were no masks for the face we was subject to all kind of fumes in the service. I am not complianing just saying. Hope the best for you if you believe in prays you are in mine. They are moving her tomorrow to resting place at the museum.A lot of people will enjoy her. Good Job 63-7868. 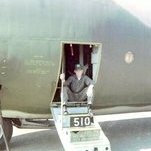 Bob you are right and did see any crew chief complain we did are job and was proud of it like landing in DaNang with a flat tire and staying with the plane all night to keep some body from steeling everthing on it! Yea! we always kept a supply of C- Rations hidden on the plane to eat when the flt. crew didn't bring anything back we made do with what we had. Have we forget what happen ten years ago! Let us not let are guard down we are still at war with the bad guys. 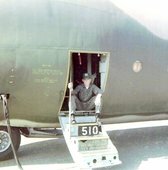 Mike anytime the planes in the 61st-62nd left Sewart AFB and was on TDY they had CC/ACC with the crew I was on tdy to Europe and the Congo South America and South East Asia while I was in the 61st. Hope that is a good thing.Spent three bad days in Tripoli as we had to open up #2 fuel tank low boost pump pressure. Changed the boost pump re sealed the tank waited 12 hours fueled her up leaked checked her for 8 hours all was well. never got a thank you from anybody as me and my asst. and a 3 level fuel cell guy done the work. That"s the way it goes.